Please find below the download link to our Opalesque 2010 Zurich Roundtable! It is estimated that around one third of all global hedge fund assets are allocated through Switzerland - the country is home to some of the most experienced and largest investors into hedge funds. Recently, an increasing number of hedge fund managers have either launched funds from Switzerland or moved their whole operation into the country. They benefit from the presence of those end-investors: not only represent the Swiss pension fund and insurance industries a lot of capital, but more importantly, this group has endorsed hedge funds relatively early on, and are now increasing their engagement in this alternative asset class. Swiss fund of hedge funds say the quality of hedge fund managers based in Switzerland is good compared to other locations, with one Roundtable participant having 15% to 20% of assets allocated to Swiss or partially Swiss-based managers - quite substantial given the moderate share of Swiss based single hedge compared to the US or UK. As a special in this Opalesque Roundtable, hear from London and New York hedge fund managers why they moved to the Zurich area, and what this experience was like. 93% of the net inflows in the second quarter of 2010 went into hedge funds managing more than $5 billion. That group of funds collectively manages about 60% of total industry assets. What is behind this trend? And what are some of the problems the industry will face if this massive asset concentration continues? Are smaller funds the way to go? Financial markets and hedge fund strategies change all the time. Apart from investment risk, hedge funds today need to cope with an increased visibility of reputational and counterparty risk. Investor due diligence demands have grown – taking time away from managing a fund. Across the board, hedge funds are forced to review their processes and capabilities. This new operational paradigm created more demands on the middle and back office to act as profit centers within the organization. What tools are now available to fit a fund manager's applications to new internal needs, and enhance workflow capability internally and with the outside world? 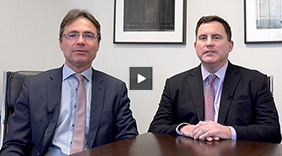 The UCITS discussion: what works and what not – will UCITS still be around in ten years? We also thank the Opalesque 2010 Roundtable Series Sponsors Custom House Group and Taussig Capital for their support. The Opalesque Roundtable Series offers unparalleled intelligence on the most important global hedge fund jurisdictions and their players. The Roundtable Series is a free publication from Opalesque and is continually updated. Please scroll down to view the full selection of our Roundtables - covering the globe! Comments: Weekly claims came in lower week over week at 196,000 on Thursday. That number brought the 4-week and 13-week averages of claims down in tandem for another week. For the 4-week avg to rise next week, we would need to see the weekly number come in above 216,000.